I will try my best to give a decent review on this movie since all I can remember are the cheesy lines being thrown by the characters. Haha. To start it off, I love R and Julie. They are the main characters of the story. R who doesn't remember his name preferred being called R and Julie on the normal side of life, is named as that, yes, Julie. Both of them are strangers. R is a corpse (again, yes, a corpse) being caged on the other side of the world by a humungous wall built by Julie's dad to separate the contamination, infection and all the negativity corpses give to the human kind. Julie is a ghost buster type of girl. She wanted to go beyond her limits and loves to use guns to protect their man kind from the people/corpses like R. Well, she's strong, determined, killer-of-corpses by heart but affectionate. Awww. While R got no emotions, lifeless in general and doesn't even know why he's there. I mean, of course, he's a corpse for God's sake! I'm not really sure about the history why corpses were there. I just heard in the movie about the Apocalypse. Maybe because they were contaminated by some radioactive that caused them to be that way. I don't know. Sorry! Anyway, when Julie together with her boyfriend and friends went to the other world (where R lives), they were attacked by corpses (there was R, too). While Julie's group exchanged bullets with some kind of chemicals in it, the corpse on the other hand played it brutally fair, they eat brains. Sadly, R ate the brain of Julie's boyfriend. However, R's soft side was brought about when he saw Julie for the first time -- Love at first sight, indeed. When other corpses smelled that there was a human being left in the laboratory, they sniffed (like a dog) until R saved Julie. He dragged Julie along with her and kept her safe. Sweeeeet! 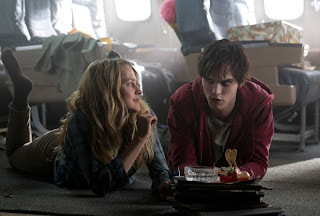 Warm Bodies was as sweet as candy and as mushy as marshmallows!! R tagged Julie to his home, in an airplane. By the way, he lives in an airport together with hundreds of corpses and bonies/eys (spell check, please). R was uneasy and so as Julie. Imagine yourself with a corpse, isn't it creepy? VERY! There are a lot of u-turns in the story that would make you sigh and wonder but all those will be covered up by the unique love story shared by both characters who were deeply in love but bounded by a huge wall both physically, mentally and emotionally. *no more spoilers* I want YOU to watch it. Hihi. 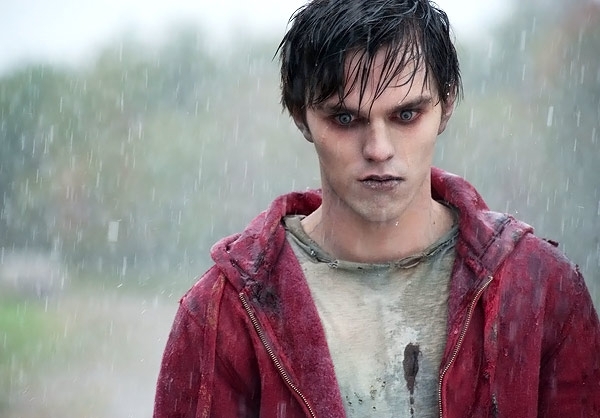 Just what I have posted in my Twitter account after seeing it, Warm bodies was sweet and charming. It doesn't sell cheap laughs! Unexpectedly funny and exciting all throughout. 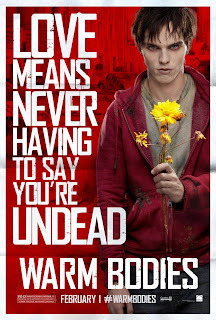 Zombies fall in love too! "R: What am I doing with my life? I'm so pale. I should get out more. I should eat better. My posture's horrible. I should stand up straighter. People would respect me more if I stood up straighter." "R: I wish I could introduce myself but I don't remember my name anymore. I mean, think it started with an R but that's all I have left. I can't remember my name or my parents or my job. Although my hoodie would suggest I was unemployed. Sometimes I look at the others and try to imagine what they were. You were a janitor. You were the rich son of a corporate CEO. You were a personal trainer and now you're a corpse. I have a hard time piecing together how this whole apocalypse thing happened. Could have been chemical warfare, or airborne virus or a radioactive outbreak monkey but it doesn't matter. This is what we are now." I rate it 9 out of 10. Isn't it too close to perfect? Well, it is! 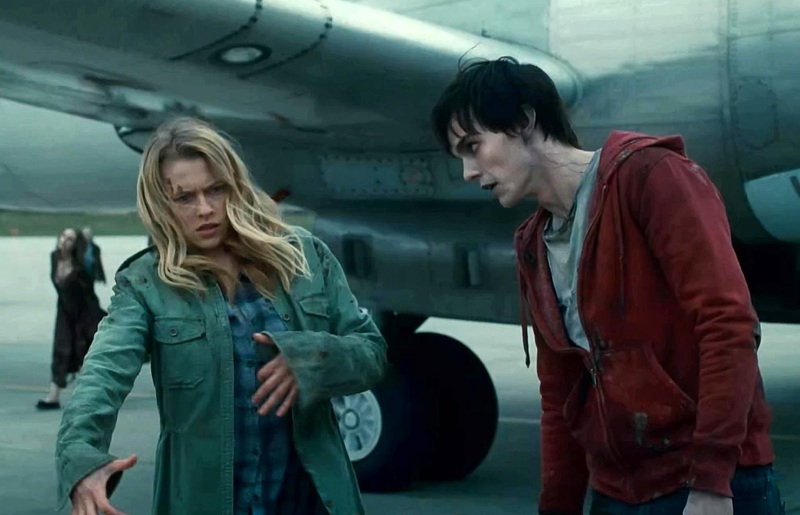 It's a zombie movie that might make you feel squishy but under completely different circumstances. Totally not expecting that in the least-bit. Nice review. Yes. it's not just another zombie movie. it's a zombie film with loads of love! Thanks for dropping by!